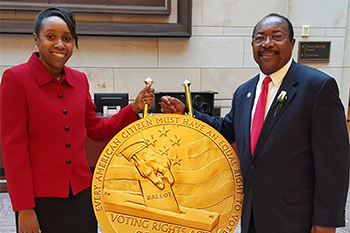 Dr. Saul Lankster with his daughter at the Congressional Gold Medal Ceremony in Washington, D.C.
National University Associate Faculty Member Dr. Saul E. Lankster II helped change American history. Now the Army veteran who was arrested as a ‘foot soldier’ in the historic civil rights marches that gripped the nation more than a half century ago has a Congressional Gold Medal for his contributions. Dr. Lankster, who holds a J.D. and teaches criminal justice and law at the Los Angeles campus of National University’s School of Professional Studies, was studying at Selma University in the early 1960’s when he became a student civil rights leader and protégé of Dr. Martin Luther King, Jr. He can be seen in episode six of the documentary Eyes on the Prize marching from Selma to Montgomery, Alabama. Dr. Lankster was arrested with many other notable leaders, including John Lewis, who now serves as a Congressman in Georgia, in the days leading up to the historic march across the Edmund Pettus Bridge. Dr. Lankster was honored with Lewis and other foot soldiers in an elaborate ceremony Feb. 24 at the nation’s Capital that included remarks by House Speaker Paul Ryan and Senate Majority Leader Mitch McConnell and speeches by Senators Cory Booker of New Jersey and Jeff Sessions of Alabama, and by the bill’s sponsor, Congresswoman Terri Sewell. He joins a corps of Congressional Gold Medal recipients that include George Washington, Ulysses S. Grant, Charles Lindbergh, Dr. Jonas Salk, Robert F. Kennedy, and Jesse Owens. “As I fought back tears several times during the Congressional Gold Medal ceremony, I thanked God for allowing me to live to see this recognition by our country,” Dr. Lankster said. Two days later, nearly 2,500 Foot Soldiers led by Dr. Martin Luther King, Jr., risked their lives once more and attempted a second peaceful march across the Edmund Pettus Bridge, but turned back at the end of the bridge while seeking protection from federal court for the march. A third march with some 8,000 Foot Soldiers protected by 2,000 Army soldiers and an almost equal number of National Guard members under federal command ended at the Alabama state Capitol in Montgomery on March 25, the number of participants swelling to 25,000 or more. President Lyndon Johnson signed the Voting Rights Act on Aug. 6 of that year. Dr. Lankster went on to serve with the Army in Vietnam. In 1967 he became the first African-American to work in the Compton Fire Department. He later joined the Compton Police Department and served several terms as a member of the Compton school board. Dr. Lankster earned his M.Ed from National University and his J.D. from Pacific Coast University School of Law, and he is married to Dr. Clara Amador-Lankster, an Associate Professor at the Sanford College of Education. For decades, he has delivered renditions of excerpts from several of Dr. King’s speeches in more than 1,000 performances at schools and federal offices across the state.